Leeks are an item that I really enjoy – but I don’t have a lot of recipes to use them. So that is one of the main reasons I picked this recipe to try out. And let me say – it was delicious. Cook’s Illustrated calls this ‘almost hands-free risotto’ since you only have to stir for a few minutes – which makes this even a better reason to try out this recipe. Definitely worth the effort – I thought it was delicious. 2. Heat olive oil in large Dutch oven over medium heat until just starting to smoke. Add chicken, skin side down, and cook without moving until golden brown, 4 to 6 minutes. Flip chicken and cook second side until lightly browned, about 2 minutes. 3. Transfer chicken to saucepan of simmering broth and cook until instant-read thermometer inserted into thickest part registers 165 degrees, 10 to 15 minutes. Transfer to large plate. 4. Add 2 tablespoons butter to now empty Dutch oven set over medium heat. When butter has melted, add leeks and salt; cook, stirring frequently, until leeks are softened but not browned, 4 to 5 minutes. Add garlic and stir until fragrant, about 30 seconds. Add rice and cook, stirring frequently, until grains are translucent around edges, about 3 minutes. 5. Add wine and cook, stirring constantly, until fully absorbed, 2 to 3 minutes. Stir 5 cups warm broth into rice; reduce heat to medium-low, cover, and simmer until almost all liquid has been absorbed and rice is just al dente, 16 to 18 minutes, stirring twice during cooking. 6. Add ¾ cup warm broth to risotto and stir gently and constantly until risotto becomes creamy, about 3 minutes. Stir in Parmesan and spinach. Remove pot from heat, cover, and let stand for 5 minutes. 7. Meanwhile, remove and discard skin and bones from chicken, and shred meat into bite-size pieces. Gently stir shredded chicken, remaining 2 tablespoons butter, lemon juice, parsley, and chives into risotto. Season with salt and pepper to taste. 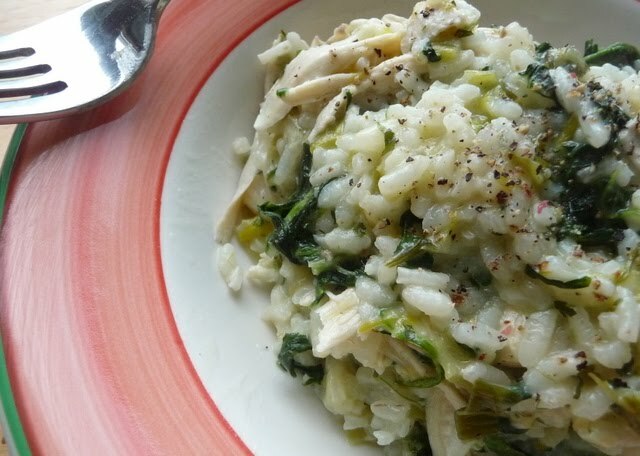 If desired, add up to ½ cup additional broth to loosen texture of risotto.